Quench thirsty skin with the Aragospa Aqua Gel Cream from Korean brand Skin79; a revitalising, creamy formula that imbues skin with instant freshness and hydration with Aragonite Thermal Water sourced from Jeju. Ideal for dry and combination skin types, a Multi-Layered Water Holding System™ ensures long-lasting water retention, while natural extracts of Vitamin-C rich Neem Tree help support collagen synthesis to smooth the look of fine lines and imperfections. 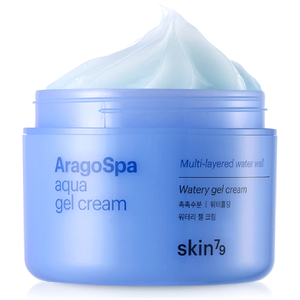 Delivering anti-bacterial and anti-inflammatory benefits, skin feels rejuvenated and replenished.